The MOMENTUM cleanroom conforms to and is certified to meet ISO 14644-1 and 14644-2 Class 5 (FED STD 209E Class 100) standards to control airborne contamination. Gowning airlock, material transition and staging area. Sliding entry doors accommodate loads on pallet jack up to 20-inch bore, ASME 600 class valve. Precision cleaning and visual inspection area. The heart of the cleanroom—includes areas for solvent wiping and degreasing, multiple-stage ultrasonic cleaning, point-of-use filtered drying, and cleanliness verification. This area is also fitted with a 2-ton cleanroom-compatible bridge crane. Assembly, test and packaging area. Features a stainless steel horizontal valve tester that has a clamping capacity up to 25 tons and accepts valve ID sizes from 3/4 to 10 inches. 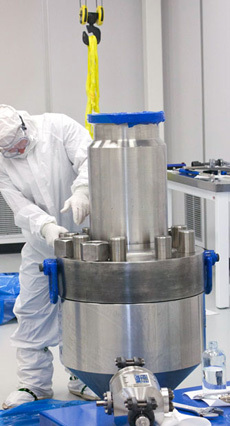 This area also has a 3-ton cleanroom-compatible bridge crane and a torque fixture. All gases used for testing are filtered at point of use. The cleanroom is surrounded by a chase area where pre-cleaning operations take place. Pre-cleaning operations are supported by clean, dry, oil-free air filtered to 1µm; a 5-ton bridge crane; a large heavy-duty parts washer; and reverse osmosis / deionized water system meeting D1193 specifications for reagent grade water. All hardware cleaned within the our facility is delivered packaged specifically to meet customer cleanliness requirements and is accompanied by a certificate of conformance. Visit our interactive facility map.